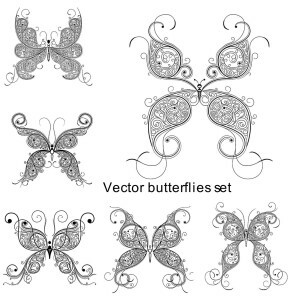 Set of 6 floral monochrome vector butterflies, decorated with swirls and floral elements. You can easily paint them and use for design of any kind. File format: .eps .Ai .cdr for CorelDraw Adobe Illustrator, Photoshop or other vector software. Tags: butterflies, floral, flower, monochrome, set.